Did you know I went to college in Kentucky? I like to think that gives me a bit of "southern girl" status. And I LOVE the south. Everything about it. Except, that is, grits... I mean, the texture is just crazy. So then why am I posting a recipe with grits? Simple. These grits are incredible! And the consistency is amazing. 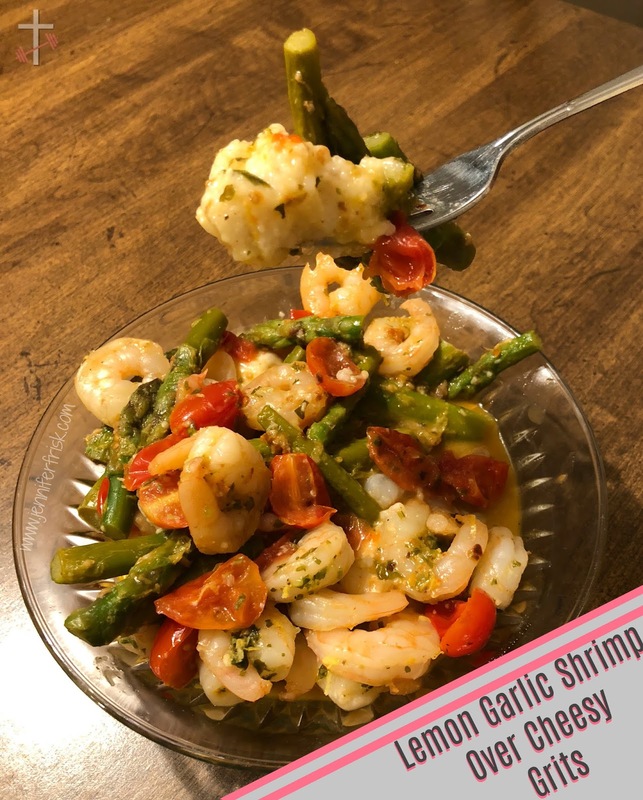 And the flavor is savory and provides the perfect backdrop for some bold shrimp and vegetables. Does it get any more colorful than that? I mean, seriously. Mouth watering yet? Then get some ingredients together and make this deliciousness! It's all ready in 30 minutes or less! Meanwhile, melt butter in a large nonstick skillet over medium-high heat. Add shrimp to skillet; sprinkle with salt and pepper; and cook 2 minutes or just until pink. Remove shrimp from skillet. Add garlic and red pepper to skillet; cook 30 seconds. 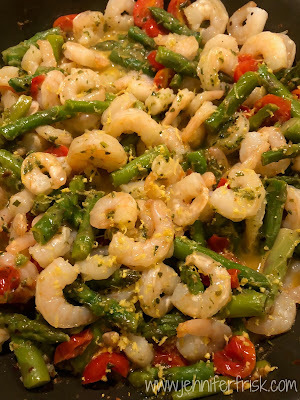 Add tomatoes and asparagus; cook 4 minutes. Add lemon juice, zest, parsley, and shrimp; cook 1 minute, just until shrimp are firm. While tomatoes and asparagus are cooking, slowly add grits to boiling water. Reduce heat to low; cover. Cook 5 to 7 minutes or until thickened, stirring occasionally. Remove from heat. Stir cheese, salt, and pepper into grits. Serve shrimp mixture over cheesy grits. This meal is so easy and quick, but you'll feel like you're treating yourself to a gourmet meal! Let me know in the comments if you try it!